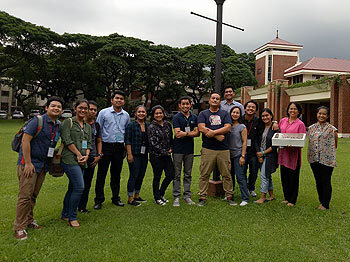 Entomologists from the UPLB Museum of Natural History's Entomological Collection gave the institution a new source of pride after their newest paper describing new species of mites was released a day before the Museum's 41st anniversary. 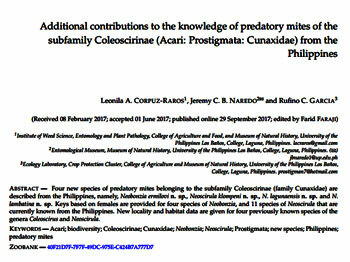 Led by Curator emeritus Dr. Leonila A. Corpuz-Raros, the group, which also includes budding acarologist Jeremy Carlos B. Naredo and technician Rufino C. Garcia, was able to describe four new species of predatory mites belonging to the subfamily Coleoscirinae (family Cunaxidae) in a paper published in the longest running journal dedicated to acarology, Acarologia. In a historic, first-ever event, more than 150 individuals from more than a hundred institutions across the country gathered at the University of the Philippines for the Culture+Learning, Art+Design, Environment+Science (CLADES) Summit last 27-28 September 2017. 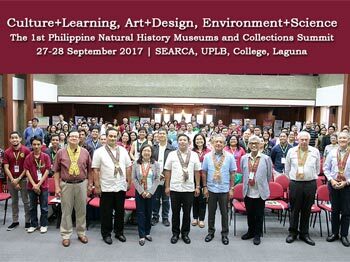 The CLADES Summit tackled concerns on culture, learning, art, design, environment and science in relation to natural history museums and collections in the Philippines. 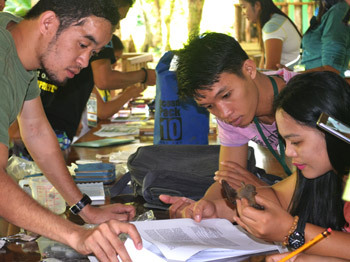 It was organized by the UPLB Museum of Natural History in celebration of its 41st anniversary which falls on 30 September. 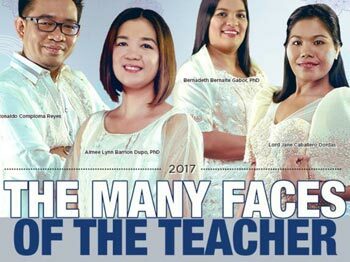 Biology professor and museum curator Dr. Aimee Lynn B. Dupo has been recognized by the Bato Balani Foundation, Inc. and Diwa Learning Systems, Inc. as one of the four 2017 "Faces of the Teacher" last 01 September at the Shangri-La at the Fort, Taguig City. She has been honored for being a scientist, leader and teacher who has enriched her students' and colleagues' perspectives on Philippine biodiversity. 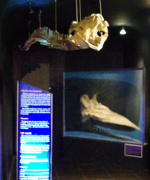 Ma'm Aimee is well known among her peers and colleagues at the Museum of Natural History (MNH) and the Institute of Biological Sciences (IBS) for her infectious enthusiasm and strong dedication to the enhancement of research and instruction in the biological sciences as evident in her many involvements for the development of new course programs, revitalisation of existing courses, refurbishing instruction materials and developing more practical and effective evaluation schemes, both within the university, and also extending support to other academic institutions. The collections of the Museum of Natural History continue to become a treasure trove of new species waiting to be described and discovered. 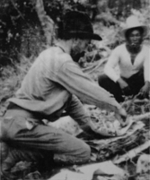 Upon examining the brachypterous cockroach collections of the Museum, research associate Cristian C. Lucañas has found two undescribed species, one of which from an undescribed genus. His disovery has been published in the journal Zootaxa (Zootaxa 4294 (1): 130–136) The new genus of brachypterous cockroach, Decoralampra, from the Philippines has been erected with the description of the species Decoralampra fulgencioi. 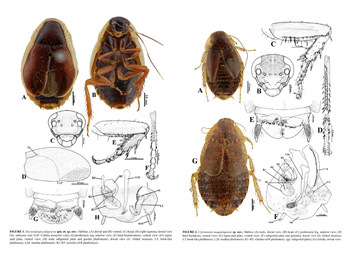 The new genus and species of cockroach is placed under the subfamily Epilamprinae. MNH thesis student and BS Biology graduate Sharri L. Guerra won first place for Undergraduate Oral Presentation during the 26th Philippine Biodiversity Symposium at Ateneo de Manila University last 18-22 July 2017. The symposium, themed "New and Emerging New Trends in Biodiversity Research and Conservation" was organized by the Biodiversity Conservation Society of the Philippines. Sharri's presentation on the "Bioacoustics of Philippine Hornbills" and garnered the highest score from the panel of judges. As part of her thesis, she recorded and analyzed calls of captive hornbills at Avilon Zoo in Rodriguez, Rizal and evaluated the difference in their call signatures as a criteria to delineate species of Philippine hornbills. Her research outcompeted 6 undergraduate presentations. 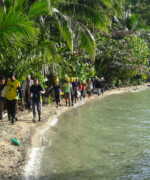 Romblon State University faculty and students and several staff of the DENR Protected Area Management Board of Mt. Guiting-guiting Natural Park were trained on biodiversity management methods by a team from the UPLB Museum of Natural History last 10-12 June 2017 at Sibuyan Island off Romblon. The training team was composed of curator Dr. Aimee Lynn Dupo, wildlife biologists James Alvarez and Camila Meneses, entomologist Jeremy Naredo, other museum staff and local field assistants. The training-workshop was held to train participants on standard methods which are applied in biodiversity studies. Done over a period of three days, the training was composed of several lectures accompanied by hands-on activities. The output of the workshop also included drafts of local research proposals aimed to give solutions to challenges that come with biodiversity management and research.